I’m always so thrilled when children’s literature steps off the page and inserts itself into our reality. I don’t need to tell any parent the importance of reading to their children from the day the child is born. One of the benefits I’ve seen is it exposes children at the earliest possible age to environments they might not otherwise experience. Unlike visual media, which can also expose children to unusual environments, when parents read to their children, they set the tone instead of the TV show producer. Children take cues from their parents. If the parents enthusiastically reads a story that takes place in an unfamiliar environment, it teaches children that they don’t have to fear what they don’t understand. Quality children’s literature does that – if children are exposed to it. I posted about this last year in Cast Out Fear and the write-up still gets frequent hits. I often find excellent children’s books at thrift shops. One book I picked up takes place a century ago in Paris and deals with the issue of an acclaimed tightrope walker who becomes afraid and is no longer able to perform. I chose the book primarily because it was a Caldecott Medal winner. The Caldecott Medal is awarded every year to an artist for the most distinguished American children’s picture book. Mirette on the High Wire quickly became a favorite during story time. 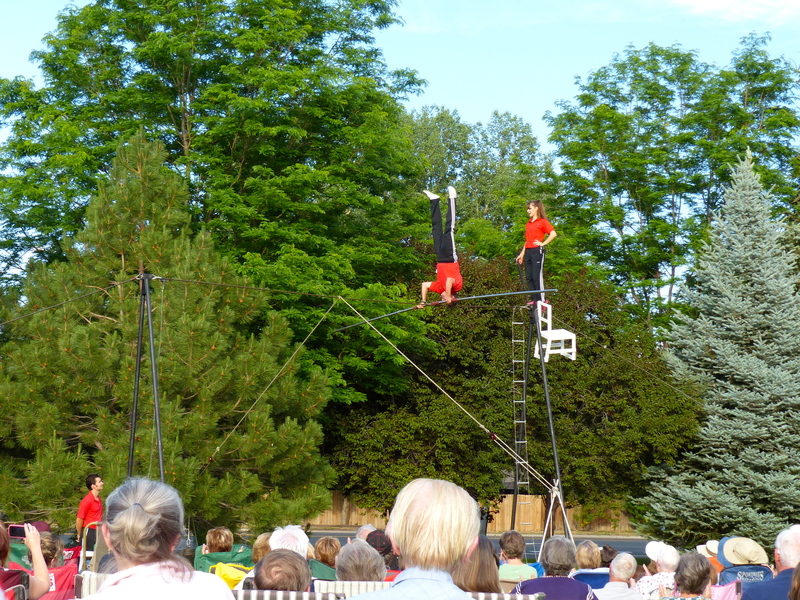 Mirette, an innkeeper’s young daughter, watches the tightrope walker practice in the early mornings and determines she could do the same. With persistent, consistent practice and good coaching she becomes the famed wirewalker’s protege and helps him lose his fear of the wire. 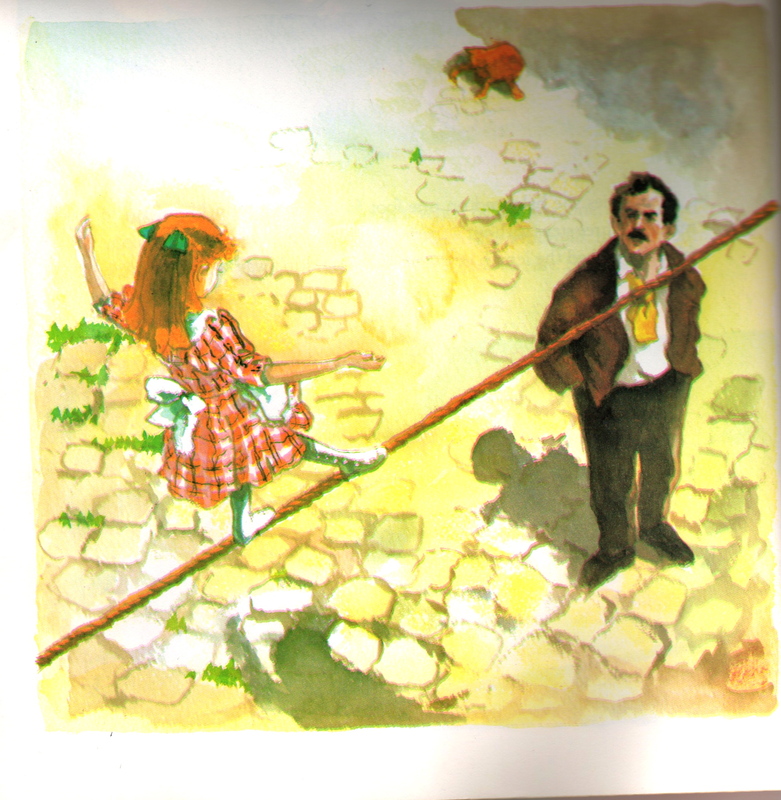 As a result of this book, my daughters were very familiar with the concept of tightrope walking. 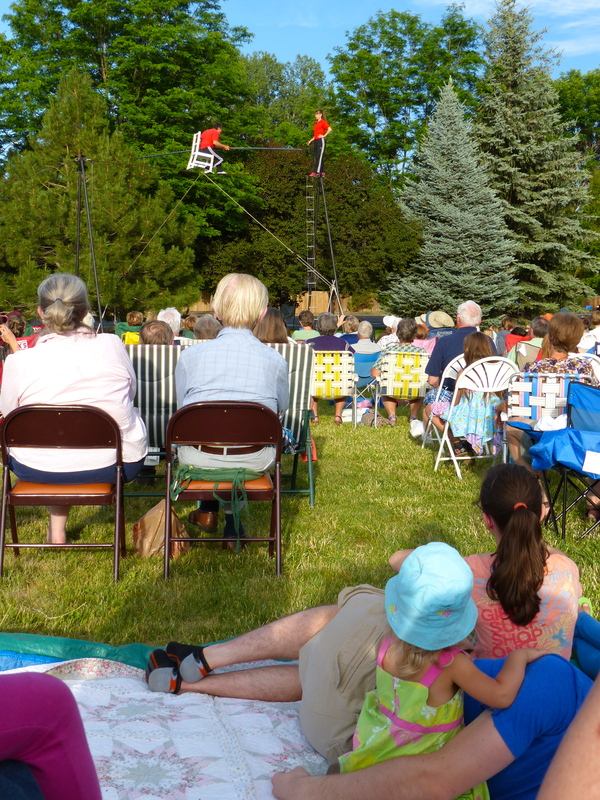 So, imagine my surprise and excitement when we found out a family of wirewalkers was going to be performing in Loveland, Colorado during our stay there on our our road trip! 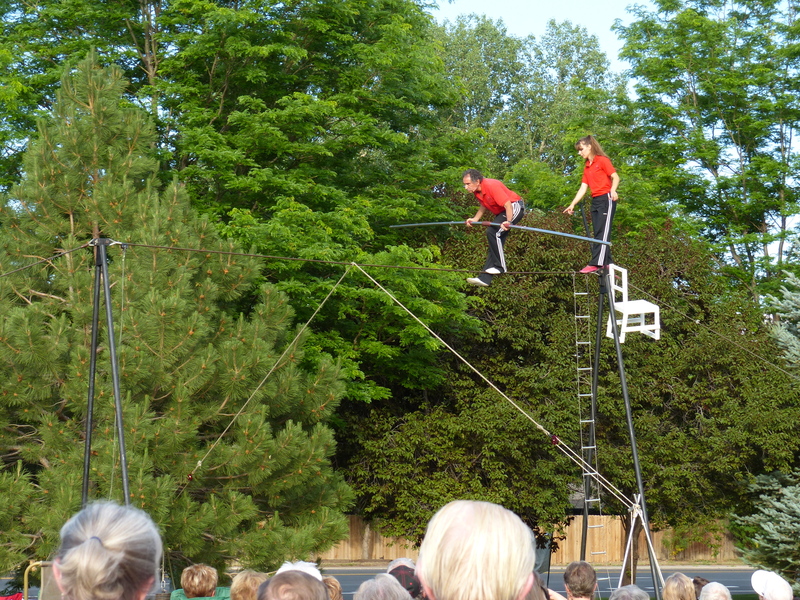 The Flying Wallendas of Niagara-crossing and Grand Canyon-crossing fame were in town offering a free demonstration. When I explained to my oldest that wirewalkers were coming, she knew exactly what I meant and anticipated the event eagerly. When we saw the wire set up, I pointed and told the girls “Look! Just like Mirette!” And it was. The Wallendas didn’t disappoint. Patriarch Tino and his children wowed and awed us with their great feats for forty-five minutes. While performing, Tino spoke about the tragedies in their family through the generations and what motivates them to keep doing what they do – traveling, performing and sharing their deep Christian faith. After the demonstration, I took my three-year-old up to meet Tino. I told him we owned the book Mirette on the High Wire and my girls were glad to see the performance today with that reading experience as the backdrop. Tino lit up. “See that girl over there?” Pointing to his twenty-something daughter greeting other members of the audience. “She was going to be Mirette. Years ago a Broadway producer approached us and said they had made a musical based on the book. She was asked to be Mirette. It fell through, but she was going to be her.” Oh my goodness! The real life Mirette (or close enough)! Well, that settled it. Off we went to meet “Mirette” and pose for a picture. Now, when the book comes off the shelf for its regular reading, we talk about seeing Mirette and the wirewalkers. The experience coupled with the literature makes for one special memory. Tino “loses balance.” Not really. It was all part of the show. . .
“Mirette” watching her dad do a handstand on the wire.